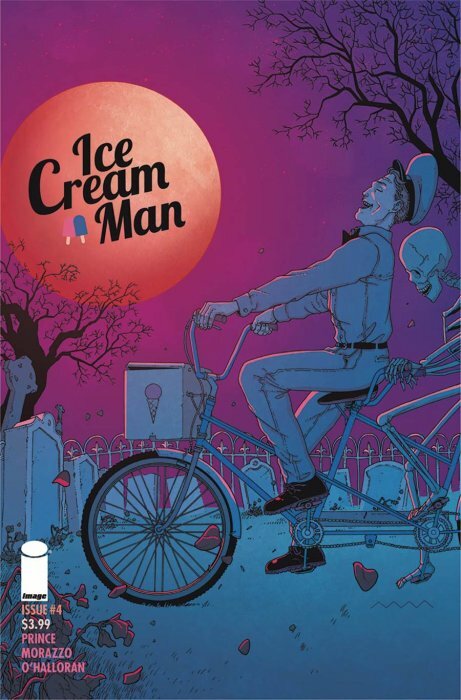 Ice Cream is to creepy spiders as Ice Cream is to a good high as Ice Cream is to psychedelic rock n roll as Ice Cream is to death and remembrance…The Ice Cream man in most contexts is really good thing. The Ice Cream Man is an anthology series that takes a different stance on each of it’s subject matters. The book jumps from horror with a werewolf to the lives of two junkies that are out to do no good. The stories can bring up only to bring you down even harder. What makes this book such a cohesive tale is the fact that Martin Morazzo’s artwork ties it all together. It’s thin and thick lines can hypnotize even the seasoned reader. Prince’s story keeps coming at us because we get enough foreshadowing to guess what’s next but not enough to keep surprising us. These stories are not for the faint of heart or those looking for hope where there might not be any. This is the collected works of the first four issues of the series. The end of Issue #4 drops a potential new character to make us wanting more of that Good Old Fashioned Vanilla Stories to look forward.